Xavier Rhodes appeared to be evaluated by medical staff on sideline, not in game for a third Rams TD tonight. Anthony Barr trailing Robert Woods on that TD. 38-28 Rams. 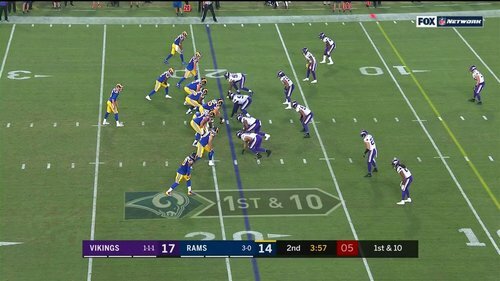 The #Vikings cut the Rams lead to 3 following the TD and 2-pt conversion.
.@KirkCousins8 ➡️ @athielen19 for the TD score! Touchdown Vikings. 2-point conversion is good. 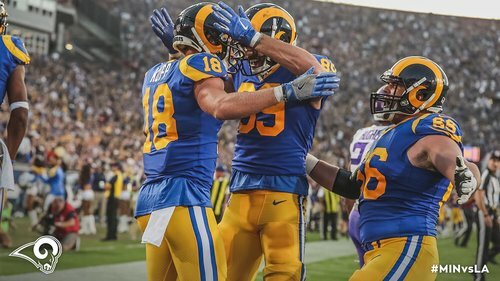 #LARams up 31-28 with 3:35 left in the 3rd. Adam Thielen finds wide open spaces by Sam Shields, grabs the 45-yard touchdown. It's the seventh TD throw of the game, fifth over 15 yards. 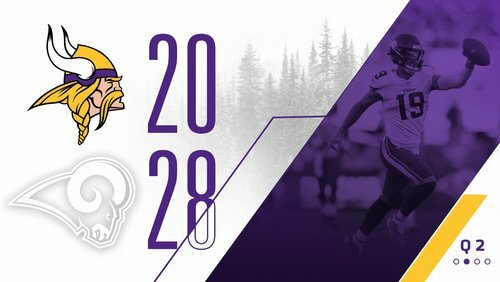 #Vikings add two points, trail 31-28. Vikings caught a break on the Sam Shields tip to Diggs, and they cashed in on it. What a catch by @stefondiggs ! 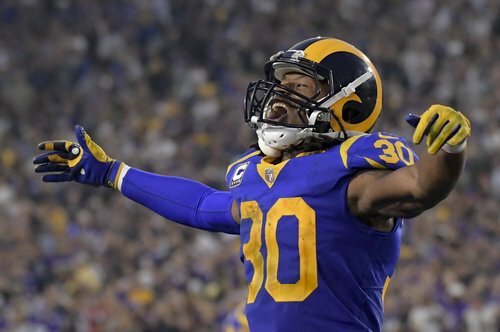 Rams take 31-20 lead over #Vikings with 5:21 left in the third quarter. Make it 6 plays of 20 yards or more, after that 56-yard pass. Referee picked up flag for block in the back. 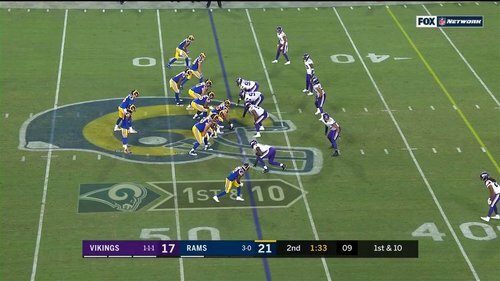 Gurley's 56-yard catch and run stands. #Vikings have now surrendered 385 yards. Thielen is putting his helmet back on. Thielen appears to be trying to convey that it is an equipment (helmet) issue, but the hit on slow motion looked concerning. Waynes is out with a concussion, #Vikings announce. Adam Thielen is not pleased he was pulled from the game before that third down. Seemed like it was the independent spotter. Medical timeout on the field, and Adam Thielen is livid as he walks off. Would assume the independent evaluator must want a concussion test after Thielen was sandwiched on the last play. The Vikings allowed 41 plays of 20 yards or more all of last year. They'd given up 10 in the first three games, and have already allowed five tonight. 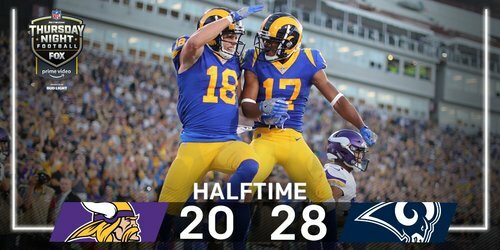 Cooper Kupp is carving up this #Vikings secondary. Trae Waynes is being evaluated for a concussion. Mike Hughes in at corner. Trae Waynes (concussion) not on the field to start the second half. Check out some of the 🔝 photos from the first half! 506 combined passing yards for these two teams at halftime. 255 for Kirk Cousins, 251 for Jared Goff. 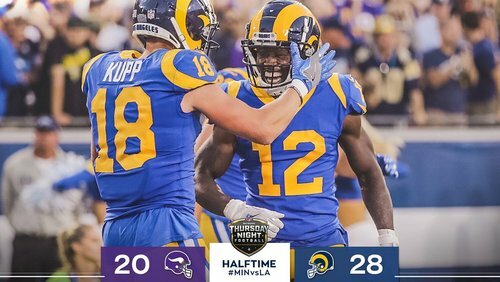 #LARams up to end the half! Dan Bailey is good from 39 yards. #Vikings trail one score, 28-20, heading into halftime in L.A.
Coach's decision. Zimmer continues to have a quick hook with his corners. Cooks had one catch for 12 yards with Rhodes covering him. One play after Xavier Rhodes gets a 15-yard unsportsmanlike conduct penalty, Rhodes is pulled to compose himself. And the guy he's been covering beats Waynes for a 47-yard touchdown. Rams up 28-17. 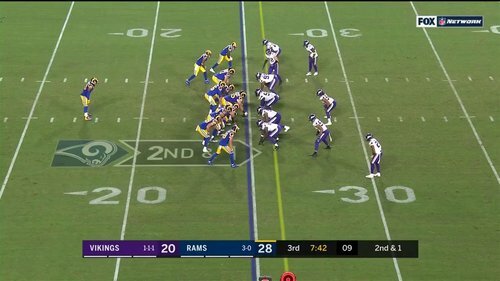 Xavier Rhodes had been following Brandin Cooks; he was on the bench after the penalty, and the Rams went right after Trae Waynes. 28-17. Rams now lead 28-17 with 1:26 left in the first half. 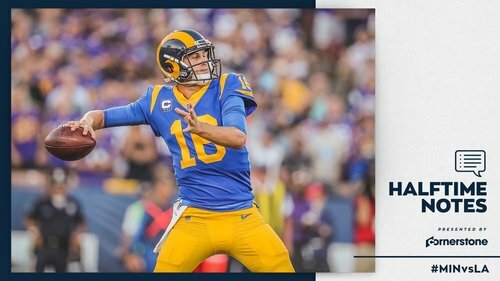 And Goff hits Brandin Cooks for a 47-yard TD on the next play. 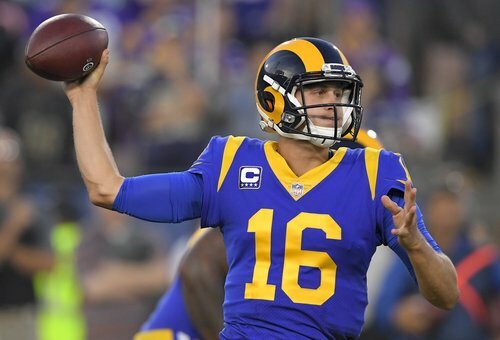 Jared Goff throws a bomb to Cooks over Trae Waynes and it's another Rams touchdown. #Vikings trail 28-17 with 1:26 before halftime. Xavier Rhodes pulled to the sideline after being flagged twice on an incompletion: holding and, after the play, unsportsmanlike conduct. Waynes-Alexander-Hughes in. Three of Thielen's five catches have converted third downs.